I've begun stringing and swatching for Scout's Bauble (we have a great trade set up)! She loves purples, grays and blacks, so I made a trip to the bead store (which is right next to the yarn store - what could be better?!) and found some really cool beads. First, I mixed the larger beads in a clear glass bowl (important to see accurate colors), in fairly even quantities. I added and subtracted until I liked the look of the mixture. 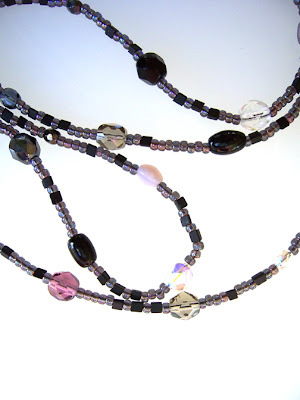 Then I started stringing with some opalescent purple seed beads, but it was missing something. So I went and found some cool little triangular black matte seed beads that I knew I had in stash. The mix was perfect! I love it! It' s a little difficult to see the proper colors in the above picture, but the real thing is a gorgeous mixture of colors and finishes. I hope she likes it! One of the things Ive heard from people doing Bauble is that, after stringing, they find that the beads they have used are too large or just don't look like they intended. My advice is to swatch swatch swatch! *g* I have tried many combinations that looked great in my mind's eye and looked horrible in real life. It's fairly easy just to slip your coil bead stops on the strand so the beads don't slip while you knit a little swatch. And it is *so* worth it! 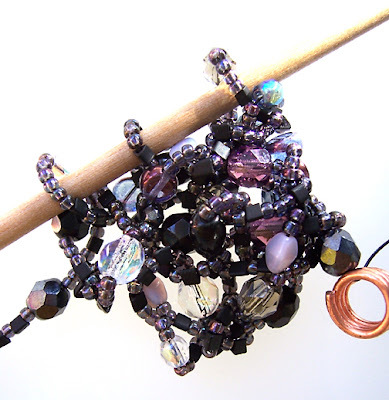 After swatching, just unravel the length of beads and keep on stringing. Or try a different combination, as the case may be. Wow! That is totally gorgeous. I love it and I'm going to start on my jet/charcoal version tonight as I just found the stretch-magic on Sunday afternoon. My gosh, I can't believe how very beautiful this is! Fascinating!